As I stated in the Argon review, Alien Magic has a very comprehensive selection of products on its website, including a ‘Pro Series’ selection of coatings and sealants. This Glass Pro is part of that ‘Pro Series’ and is accompanied by fabric, trim, metal and paintwork sealants. If you register on the site, Alien Magic will give you 10% off your first order. Alien Magic is a relatively new company, formed in 2016. Their beginnings revolve around the owner being somewhat disappointed with how similar detailing products of different brands can be, so he set out to make his own, high quality products. 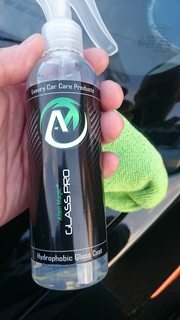 To make sure Alien Magic Glass Pro was given the best possible surface to bond to, the windscreen on my Ford Focus was cleaned thoroughly, clayed, and wiped with a 50% IPA solution. 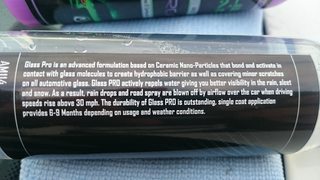 As part of Alien Magic’s Pro=Series, the branding for the ‘nano’ products appears to be deliberately unique from the ‘normal’ Alien Magic products. I actually quite like that, as it gives the impression that they’ve really engineered these products to be special. I’m a sucker for a good brand! The product supplied was a 200ml spritz bottle, clear PET with a spray head included in the box. The product itself is a thin, clear liquid, with a heavy chemical scent. The spray head appears to be the standard for these type of products, allowing a spritz of product, rather than a spray or stream. There are very clear application instructions on the label, along with some background information relating to the product ingredients. Glass sealants are a fabulous addition to any detailer’s arsenal, the ability to repel water ensures your windscreen wipers will last you much longer. Having had a good read, I followed the instructions. I think at this point it’s worth mentioning that I had a some teething problems with my bottle of Glass Pro. I sent a message to Adrian at Alien Magic, and he very quickly sent me a replacement bottle, along with some of their Wax and Residue remover, and some glass cleaner. So, I set to work. I cleaned the glass thoroughly with Alien Magic Wax & Residue Remover, Alien Magic glass cleaner, clay and IPA. One thing I noticed was that the the instructions on the website, and the instructions on the bottle differ. 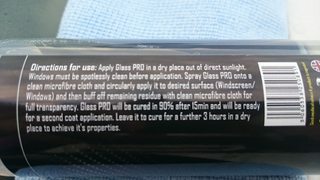 The website instructs the user to spray directly onto the glass, one window at a time. The bottle, however, instructs you to spray onto a microfibre and apply in a circular motion. It’s really no biggie, but worth having consistent instructions across your products and platforms. Anyway, on with the review. As the bottle was in my hand, I followed the instructions on it. 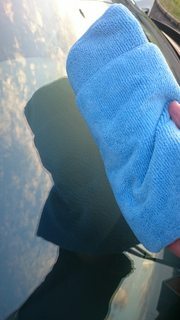 Another clean microfibre was used to buff of any residue. There was a significant amount of bite at this point, and the residue was slightly difficult to remove. 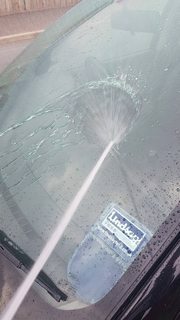 I didn’t really mind as it made me feel that the product was really sticking to the glass. I waited 15 minutes and applied a second coat in the same manner. And then allowed it to cure for 3 hours before testing.…. It worked excellently. I’ve actually tested this over the past 4 weeks or so, and the Glass Pro is still performing really well. 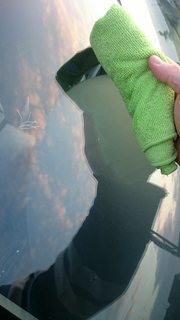 I’ve used the wipers on occasion, and given the state of the roads, have frequently used strong screen wash. Glass Pro is still clearing the screen from around 40mph. Here's a short vid of the water behaviour after around 4 weeks. The price is £15.99 for 200ml. Alien Magic currently also provides free standard 2-3 day UK shipping on all orders, with next-day delivery available for £6, if ordered before 12 noon. See https://alienmagic.co.uk/shipping for further detail. Yes. I’ve been using glass coatings for many years, and this definitely worked for me. Very easy to apply, and evidently long lasting. Alien Magic Glass Pro impressed me. Water ran off at speeds over 30-40 mph, depending on the droplet size. Early indications are good, in that after 4 weeks, performance hasn’t really dropped off to any noticeable degree. It’s set at a good price point, but you really don’t use much to treat all the glass, so a bottle should last for ages. One thing, and I mentioned it earlier, is the slight ambiguity in the instructions for use between the website, and the printed bottle label. A minor issue that should be easily fixed, but one that should really be sorted out. Thanks for taking the time to read, peeps. Thanks very much for the honest review Cookies, very in-depth and great visuals. We totally agree about the conflicting instructions on the website verses the bottle, the website has recently been updated with a lot of new and helpful text and some directions have been amended to provide improved results. The instructions on the bottles will in no way harm the performance of the products, we have improved them on the website and the products will all have matching instructions. Any chance of a video of the water behaviour? I've no doubt you were aware of it, but it's probably one of those things that gets left when you're in the throws of product development, testing and launch. By the way, it's still going strong. Here's a very short video of it in action after more than 3 weeks. I actually had to have a look at that pic again. I'd have been mightily impressed if that had have been me, but I promise it wasn't. I've uploaded a short vid of the water behaviour in the opening post. Let me know what you think, buddy. Last edited by Cookies; 16-04-2018 at 06:56 AM. I tried to upload a vid there, bit it didnt work for me. Absolutely Cookies, I'm glad you pointed out the conflicting info so that others can double check the instructions for any other products that have also been amended. The video shows how aggressively the water is sheeting off after 3 weeks which is great.